If not there will be, by default, a no deal Brexit. That outcome would be not only a political and practical failure, but a moral one equally as serious as ignoring the result of the referendum entirely. A second referendum is not my preference, but if Parliament fails in the task entrusted to it, then regrettably it may be required. This is about more than Brexit, and Parliament must not show itself unfit for the job. (b) the framework for the future relationship between the EU and the United Kingdom after withdrawal. (ii) a motion for the House of Lords to take note of the statement mentioned in paragraph (a) to be moved in that House by a Minister of the Crown within the period of five Lords sitting days beginning with the end of 21 January 2019. Baroness Smith of Basildon moved that this House, while noting that it is for the House of Commons to determine the matter, considers that a no deal outcome to negotiations under Article 50(2) of the Treaty on European Union must be emphatically rejected, and regrets that withdrawal from the European Union on the terms set out in the Withdrawal Agreement and Political Declaration laid before Parliament would damage the future economic prosperity, internal security and global influence of the United Kingdom. Are there really only four bishops upholding a moral Brexit? If no deal (aka a clean, global Brexit on WTO terms) represents a moral failure, what is the morality of legislating to permit that failure? What is the morality of abstaining; of voting neither to permit nor to prohibit that failure? What is the morality of fence-sitting? A bishop who abhors the existence of nuclear weapons (or the ‘moral failure’ represented by nuclear war) isn’t going to vote to renew Trident, is he (or she)? The moral Christian political vocation is to mitigate evil to improve the human condition. If you are appalled by the sheer scale of indiscriminate destructive power represented by nuclear weapons, as the Bishops are (because it “pulls against any international sense of shared community”), you would seek to eradicate them and so vote against their existence at every turn, wouldn’t you? For the Christian, moral decisions must be made by deciding in specific situations which actions best correspond to scriptural principles. This requires wisdom and discernment: wisdom to walk between human finitude and freedom; and discernment to distinguish the holy and transcendent from sinful self-assertion. To this we bring reason and experience, yet it must be observed that empiricism is infinitely individual, and each of us in our world of senses struggles with our own moral failures. The more we interrogate our histories and the more honest we are about our own natures, the closer we come to truth. No deal (aka a clean, global Brexit on WTO terms) is the current legal default position. Since the Archbishop of Canterbury believes this would be an immoral path (despite the Archbishop of York having voted for the possibility), he now favours a second referendum, or a ‘People’s Vote’. This may be where his own life history and personal moral failures have led him, but it is by no means a universal moral truth. He says he is concerned with what a no deal (aka a clean, global Brexit on WTO terms) might inflict upon the poorest and most vulnerable in society. How are the poorest and most vulnerable fairing in Greece, Italy, Spain or Portugal? When did the European Union and membership of the Euro become the solution to unemployment, poverty, social exclusion and despair? 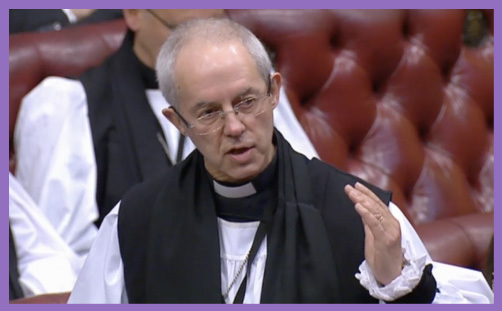 No doubt Justin Welby finds all manner of analogies between scriptural stories and UK membership of the EU: sacred principles of neighbourly love and parables of unifying order may indeed illuminate his imperative vision for a Brexit deal. But his understanding is not everyone’s apprehension, and his imagination is not universally conceived. His solution to no deal (aka a clean, global Brexit on WTO terms) is a second referendum, so the lesser evil, he discerns, may be no Brexit. How would that bring peace and reconciliation? How would it bring an end to economic uncertainty and heal our divisions? How would it mitigate social conflict or the possibility of the rise of political extremes? What if a second referendum represents the most serious democratic failure and so a more grave moral failure than no deal (aka a clean, global Brexit on WTO terms)? What if a second referendum increased anxiety, exacerbated uncertainty, enraged society, worsened poverty, and plunged the nation into a political crisis the likes of which we have not seen since 1653? Where, then, would be the moral failure? And what, then, would be the moral standing of those who were responsible for precipitating it?